Updated for January 2019 – Over 200 Verified AMCs! Do you want more appraisal orders? Are you looking to recession proof your appraisal business by getting more estate and FHA appraisal requests? Do you want the ability to select the best paying and most desirable appraisal work from the appraisal management companies? The author personally verifies and signs up to each company listed. The author calls the AMCs to find out where there is an immediate need for appraisers and let his customers know. Vendor Specific errors to avoid are listed so you make fewer mistakes. from the beginning and get more repeat orders. 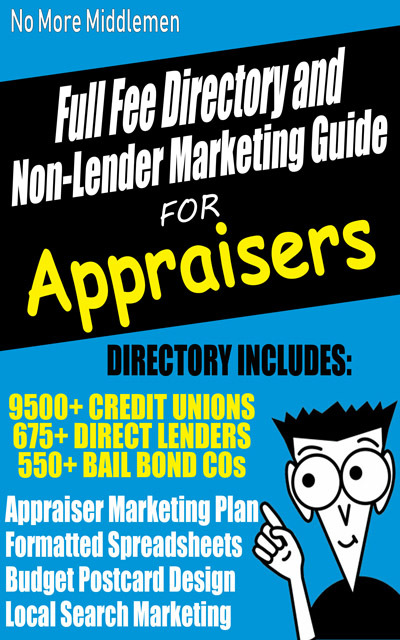 The guide contains updated non-lender marketing tips and advice. Top techniques to generate more revenue. Professionally designed website is included if you are interested in getting more estate work. This guide lays out all the details on how to get signed up with the appraisal management companies and information on creating top ranking websites. This AMC Resource Guide stands far above the rest. The first 50 companies send 90% of the author’s work. There are two versions of the directory – printed (mailed to your office/home) and electronic (emailed to you). The printed version is $99.95 ($89.95 for OREP members). The electronic version is $79.95 ($69.95 for OREP members). Once purchased, the printed guide will be shipped priority mail, arriving in your mailbox within a few business days; the electronic version will be emailed within one business day in PDF format. 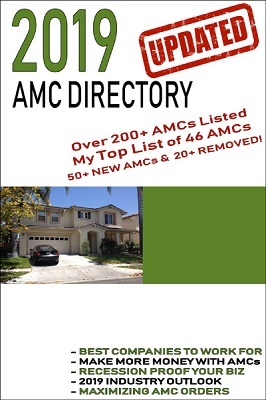 Save when you purchase both the AMC Resource Guide AND the Full-Fee Directory! ***Upon checkout, SAVE when you purchase BOTH the AMC Resource Guide along with the Full Fee Marketing Guide! ***The author of the AMC Guide is also featured in OREP/Working RE’s latest Webinar Series: Maximizing AMC Orders and Income. To learn proven strategies for maximizing orders and income when working with AMCs, check out these webinars.